The location of the hotel is excellent. It's a 15-minute walk to the nearest station, Batu Ceper, where you can take the railink train to the Soekarno-Hatta airport. You can take a taxi ride for USD 1 or less. There were some food stalls near the hotel, but nothing like a proper restaurant. You can try the hotel restaurant, I didn't, but there aren't that many choices on the menu. Everything outside the guest rooms looked great, the lobby, the restaurant, the pool, etc. The breakfast was excellent. The staff was just efficient, friendly and helpful. The interior of the room was so so., however. There was no bathtub. I expected one for a **** hotel. The bath towels weren't quite white, giving the impression that they weren't clean. The internet was fast. There was a large open terrace outside the room, but the glass door cannot be opened. 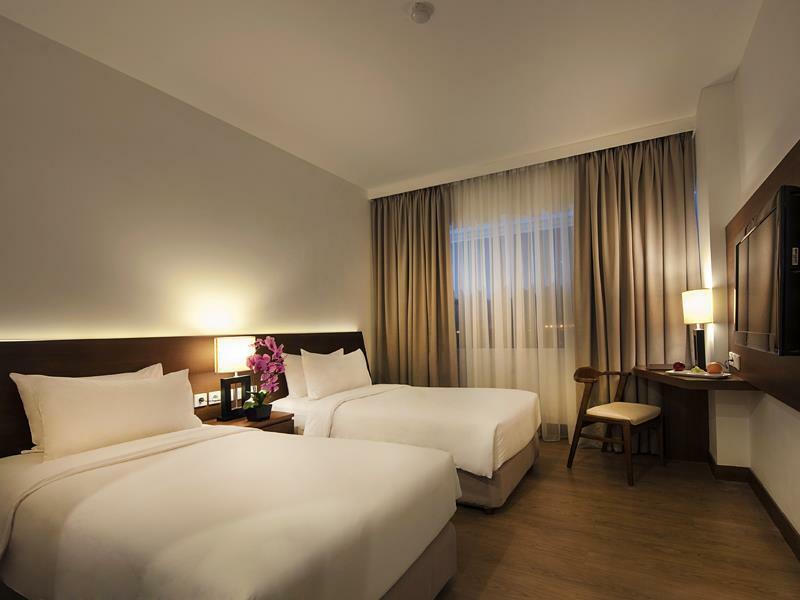 Overall, it's a very good choice for a hotel near the airport. Hotel is ok... Only serve no beer or any alcohol...maybe it.is time to mention this in hotel description... Further bad place for swimming pool...the place is bad, the acces and the pool itself too... Further it is ok... But will not come back because of alcohol policy... i have the right to decide myself what and if i drink.. 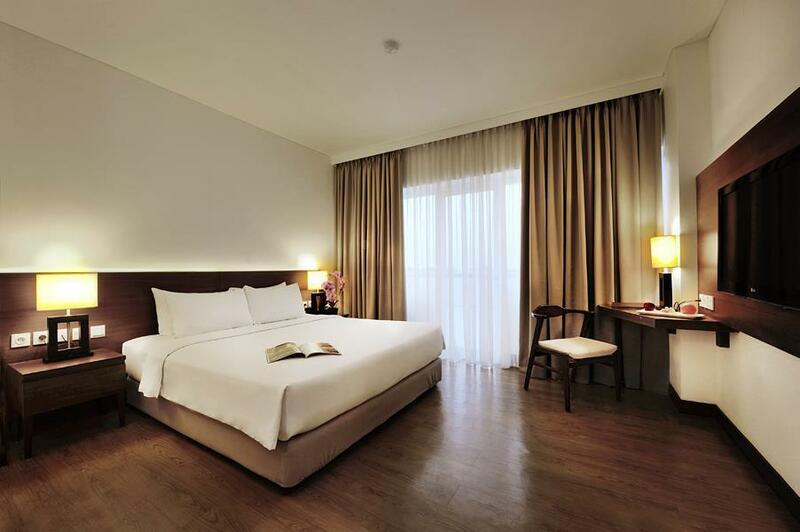 Location is near to airport far from jakarta city. If you have business outside jakarta, this is good location. Though the hotel is near to airport it still takes about 45 mins, but better than go to jakarta city. It is near to the mosque and be prepare for the morning wakeup call from the morning prayer. The food is good. Stayed at this hotel because of friend's wedding on monday at the banquet hall. Pleasantly surprised by the excellent service provided by the staff. 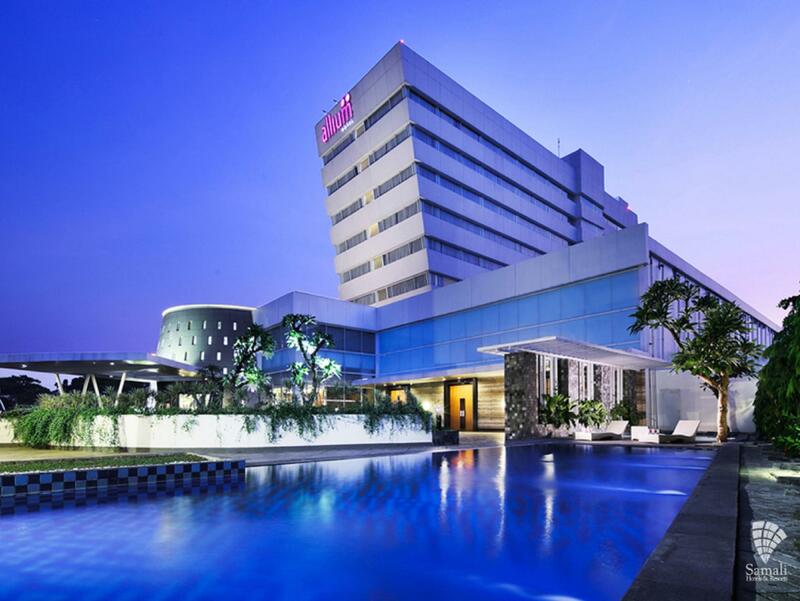 it's not far from Tang City Mall and the more upmarket Summarecon Mall Serpong. Staff enthusiastically assisted with calling cabs or Uber/Grab for any near & far destinations including to Jakarta. They have full load of information including the small little ones that you can't find on google or elsewhere, some of which actually change our earlier travel plans which were google/online heavy. For those of you who like local Indonesian neighbourhood environment like we do with all small little coffee shops, restaurants, fruit stalls, mini-market etc, its just a few minites walk away from the hotel. There's a middle class cluster housing nearby and the shops/restaurants cater to their needs. 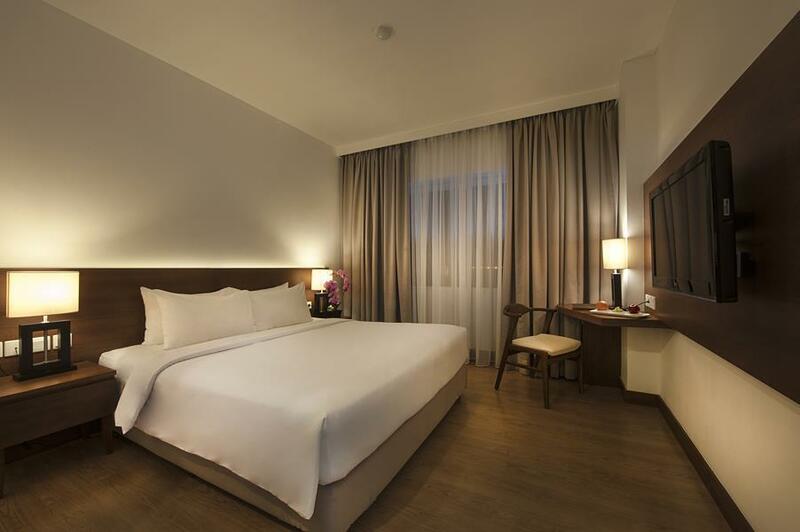 There's no reason why Allium Tangerang's hotel guests can't patronise and enjoy the nearby products/services and the fairly vibrant environment instead of just doing mall-hopping :-( I'm likely to choose this hotel again as a base when in Tangerang. The hotel is great with the World Class treatment from outstanding staff Miss Stella And Mr Dede that being proactive during my stay. Great location for local food and transport. Breakfast was awesome and the room is really top star clean. We have stayed at the Allium several times and each time have enjoyed our stay. The staff tries very hard to please and goes the extra mile. The airport shuttle is convenient, the rooms are comfortable and clean (with exception below), and the breakfast is nice. They also have a great cafe for some nice coffee. However, each time we have stayed there, we requested non-smoking rooms but the "non-smoking" rooms stunk of smoke (even though the rooms really were non-smoking). The staff quickly changed our rooms to accommodate us. My suggestion to them is have their cleaning staff check more thoroughly and if the room stinks of smoke then charge the offender and clean the room. Even though it was a short time, one night only, but this hotel was very nice. Due to the traffic jam on the way, it took about 1 hour to reach this hotel by taxi around 22:00pm. It made me a bit tired and nervous but the hotel was nice enough to ease me. One thing I would like to ask is about drink in the restaurant. They had nice mocktails, but they do not any alcohol. It would be much better, if they could serve some wines or something. The restaurant karaoke must not be used for singing that is practically shouting already coz it disturbed othet cuatomers. Or the least u can do is to modulate the volume if the speakers ans turn it down. Or a karaoke room for 10 people that is sound proof. We stayed at the Allium just for one night but we've enjoyed a good time there. The room was very nice and clean, comfortable bed and the staff was very friendly and helpful. The breakfast was great with a lot of different kinds of food, so prepare yourself for eating huge amounts :) Since it's close to the airport it's the perfect location if you've just a one night layover in Jakarta. Mostly good. Room is clean, batroom is clean. Breakfast was excellent, so many varieties. However, please don't serve "Peking Duck" if you don't have enough ducks. I was disappointed when the duck always out. And finally, they only served chicken. The a la carte menu at the Paris-Lyon Restaurant was so-so and the price was expensive. I hope the hotel management will improve the food quality. We couldn't swim here because the pool was small and it's just discouraging, I don't know why. Value for money, free airport transfer, great bed! Great experience as a solo business traveller in transit. Quiet room, great bed (= fantastic sleep), gym and hi speed wifi. Food & coffee could be improved but overall I had a good experience and would recommend for close proximity to airport (when not in peak hour traffic). Free airport transfer a plus. It takes roughly 40 mins from airport, they need to put more sign on the street a bit difficult to find the hotel. Nearest Tangerang City shopping mall takes about 5-10 mins taxi rides. Quite spacious room, pleasant breakfast.